Sam wanted to buy something for everyone in her program this year, (which was 36 people) so we compromised on making them something. We found this idea using the mini candy canes and melted chocolate, and thought it was a perfect little treat, that was relatively inexpensive. Dylan on the other hand insisted that we don’t even give his teachers presents this year. Sams friends organized a secret Santa, amongst themselves, and she did presents for individual friends as well, plus teacher gifts, and these treats for everyone in her class. Teenaged girls and boys are so different! The only ingredients you need are candy canes, chocolate, and sprinkles. We started by melting the chocolate in a sandwich bag in a cup of hot water… this is by far my favourite way of melting chocolate. When the chocolate has all melted, cut a corner of the bag off. I even started reusing the bags by using the other side of the bag to melt the chocolate, then squishing it back over to the side with the hole when it was all melted. I was worried about the chocolate flowing out through the cracks, so I started trying to do an under layer, letting it harden, the doing the top. Turns out, it wasn’t necessary, the chocolate hardened before it had a chance to flow through most cracks. So, my advice, is to fill it all in one go. Just squeeze the chocolate out, give the tray a few gentle taps to settle the chocolate, then add sprinkles. You can let them harden in the fridge, but I found that they became very brittle, and we broke a few because the chocolate and candy cane just snapped apart, so if you are storing them in the fridge, let them warm up before you try to package them or transport them. We put them in little individual bags, they were so cute! I would make these again for sure, quick and easy! So I have managed to avoid work a few nights lately because I decided to change up our family room this season. I just love the trendy black and red decor that is everywhere this year. I learned that it is called Buffalo Plaid. This is the picture I started with for inspiration. I started by going to fabricland and I bought some plaid fabric and a black and red checkered pattern. I used the thicker plaid fabric to sew a table runner. I just sewed the rectangle, and did a blanket stitch around the edges. And I used the checkered material to make some heart ornaments. Then, I used a few of the fabric scraps to make checkered bows to add to the tree. I dug up all of the rustic, and red or brown ornaments I could find for the tree. Here is a pic of our family room buffalo plaid themed tree. It’s probably not the best picture of the tree skirt, but I also bought a panel from fabricland that had a tree skirt. I cut it out and finished the edges with a blanket stitch, and I also sewed the stockings -you can see them in the photo with the fireplace. 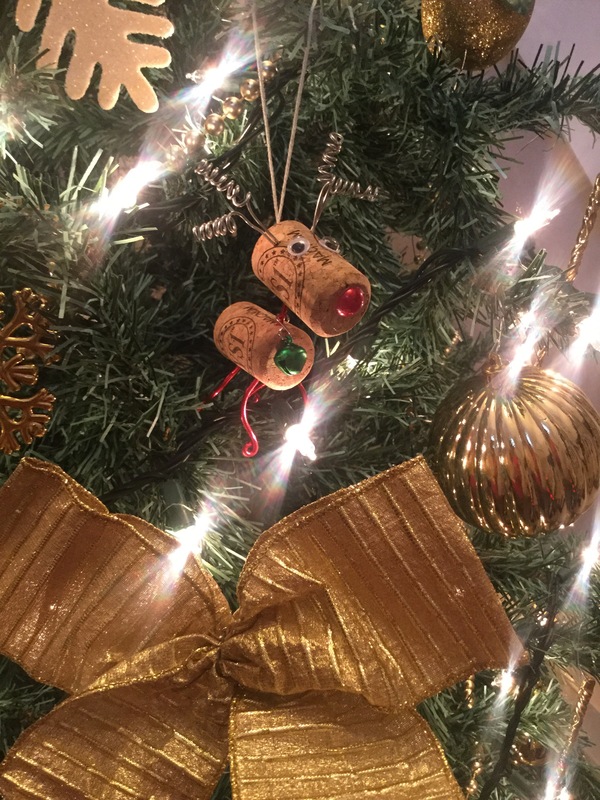 Here is a closer shot of a few of the ornaments…. And here are some other pics of around our kitchen and family room…. I love the black and red with our new table. I ended up using the table runner I made on the desk. I got tired of taking it off and on the table every time we ate. I think I might stick with this theme for a couple years! Although, the week after Christmas is when I tend to buy most decorations. I have them sorted by colour, and sometimes I will just move the decorations and colours to a different room. If I have time, I’ll post some pics of our hallway tree, which is gold and silver theme; our upstairs tree, which has a Santa and snow globe theme; and our dining room, which is a work in progress. 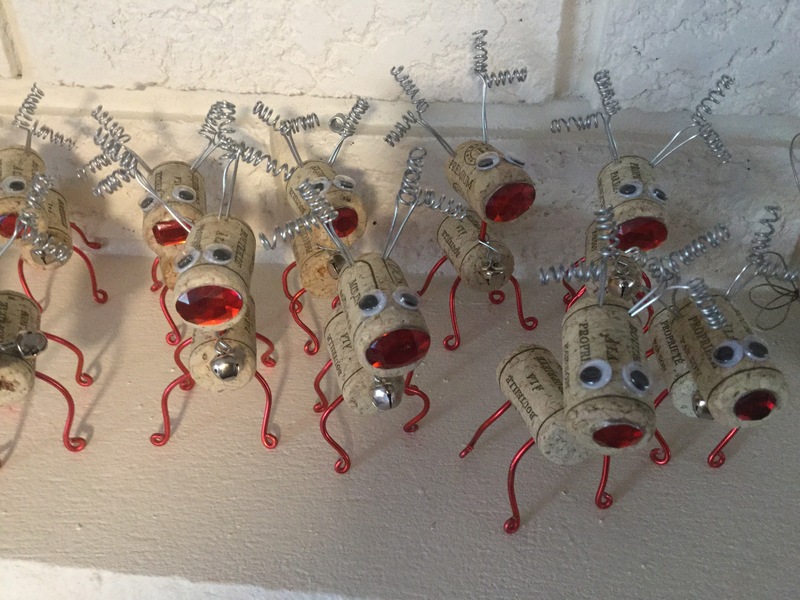 I wanted to post instructions for these reindeers last year, but never got around to it 😦 but, I came across the pictures, and thought I would share now. I have done a couple craft sales in the last couple years, and the reindeers always sell really well… there is just never enough time in December to make stuff, bake stuff, and post about everything! 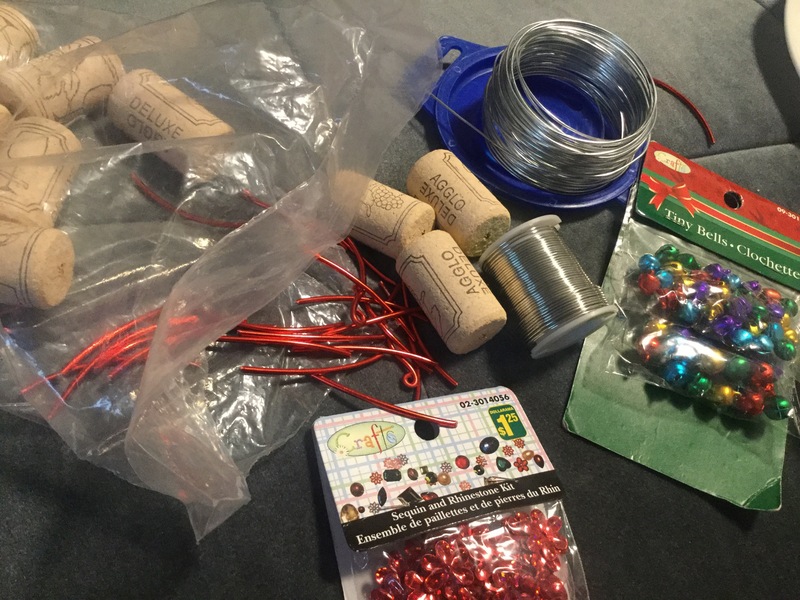 And, by the time I have some free time, Christmas is over and it’s too late to post about Christmas crafts! So, I’m going to take a few minutes to share tonight. 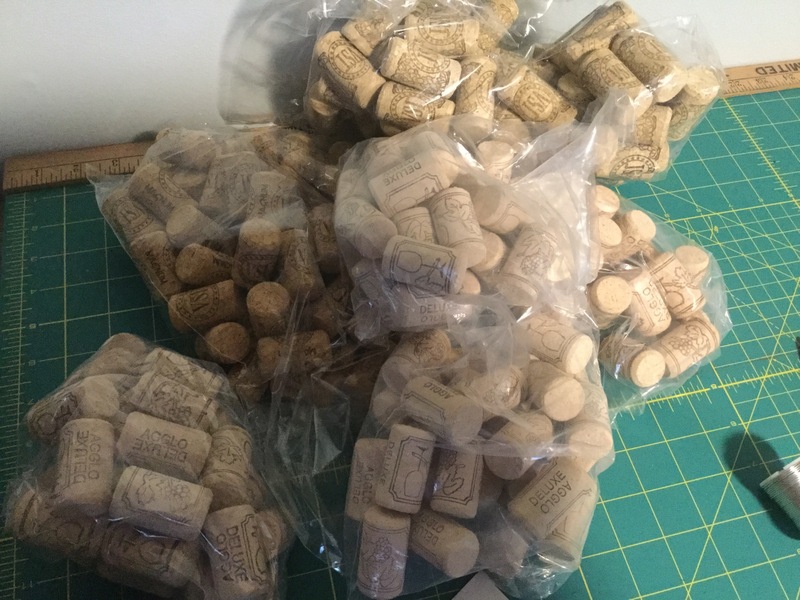 And here is the stockpile of corks I got from Markham Heritage Wines! 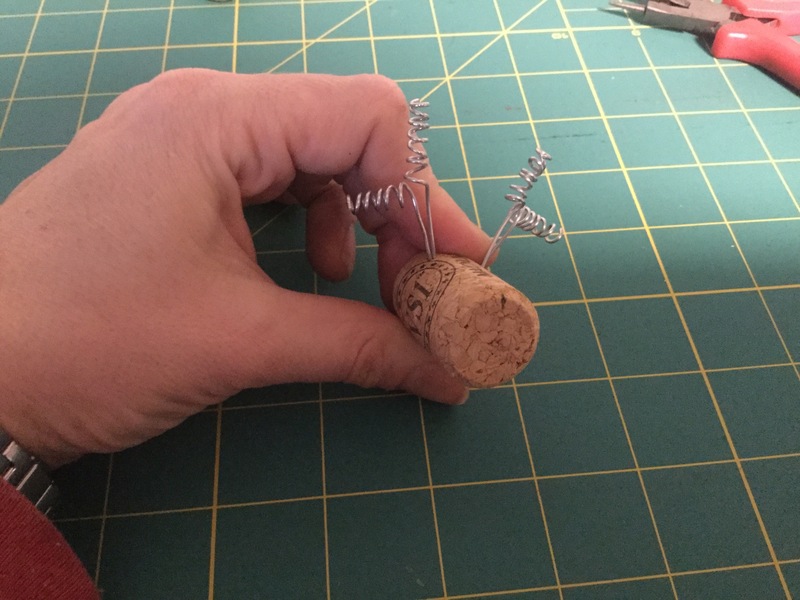 I used the pliers to poke holes in the cork, but a barbecue skewer also works great. Then, stick in the legs. For the antlers, you need four lengths of thinner wire, about four inches long each. 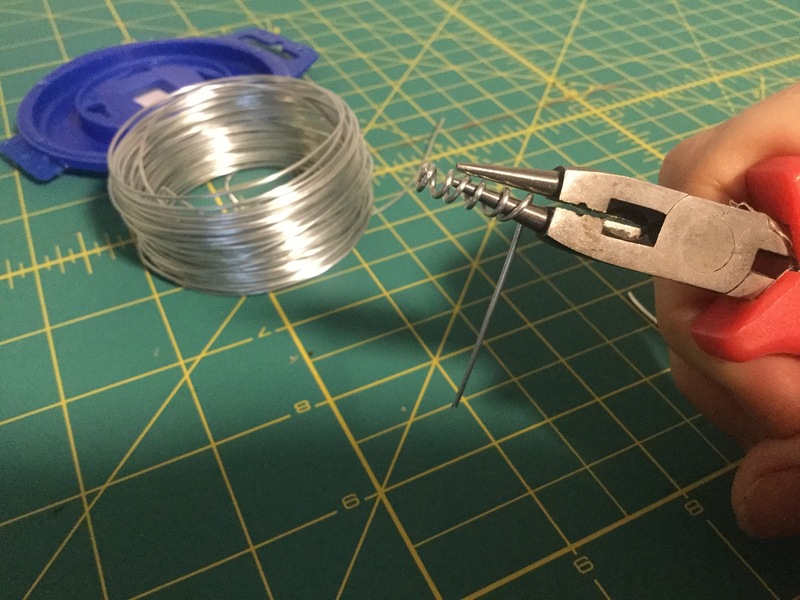 Then use a pair of needle nosed pliers to bend the wire into a spiral. 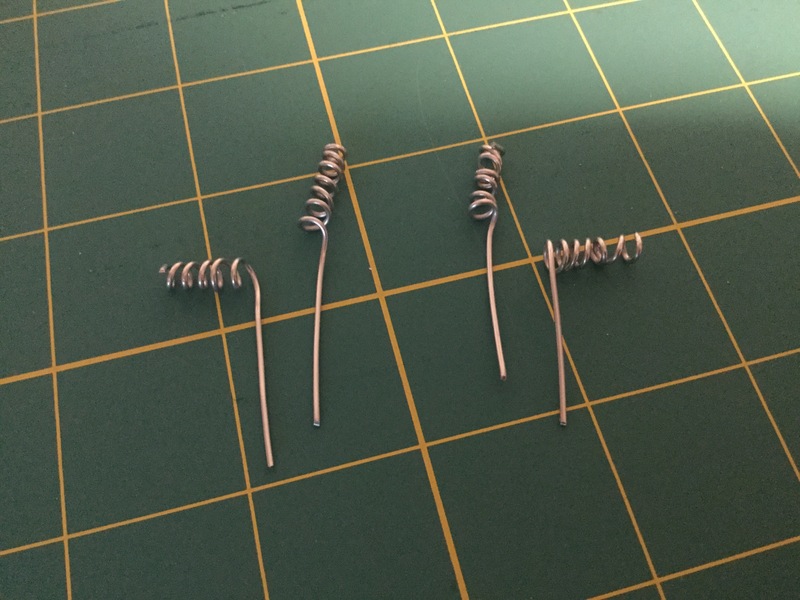 I left about an inch at the bottom of each wire straight. Then, bend two of the antlers at a 90 degree angles, and leave two straight, like in the photo below. 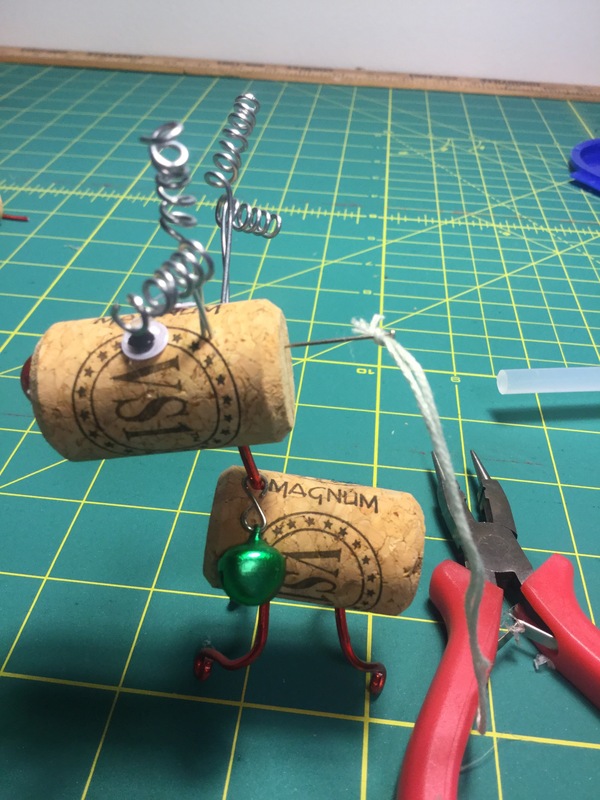 Place the antlers into a second cork in pairs, like the below photo. 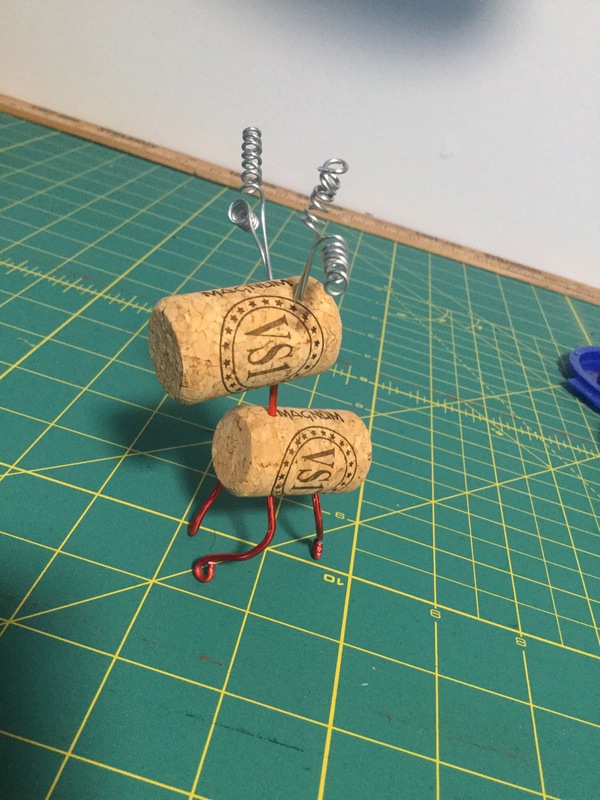 Next, use a smaller length of the thicker wire to make a neck and attach the head to the body. 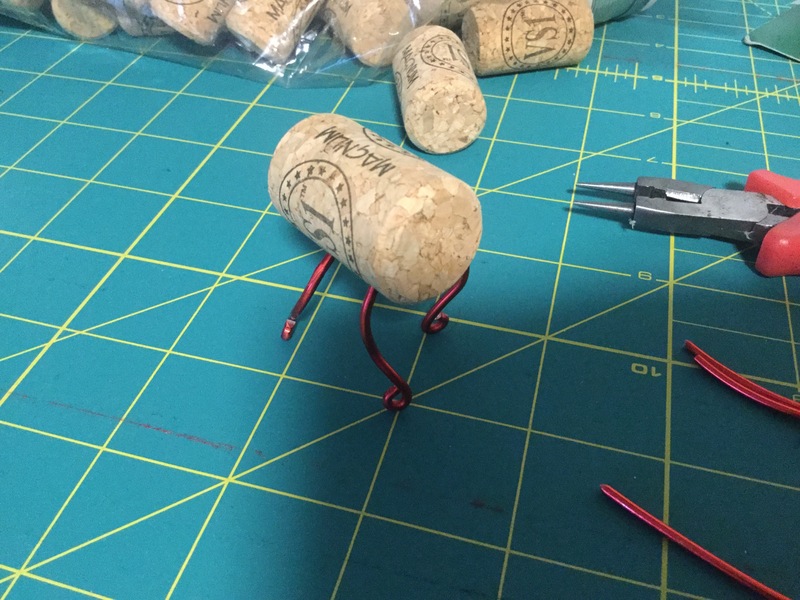 Whenever I used the thicker wire in the cork, I found that it went in much easier if you poked the hole first with the needle nosed pliers, or a bbq skewer, otherwise the wire kept bending. 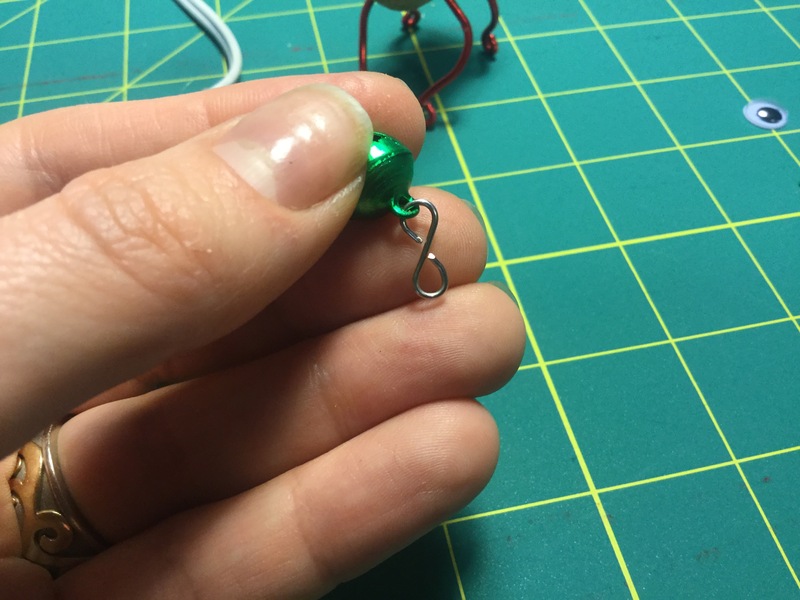 I used the needle nosed pliers to bend a figure 8 to attach a little coloured bell for around the reindeer’s neck. A bow would also be cute. 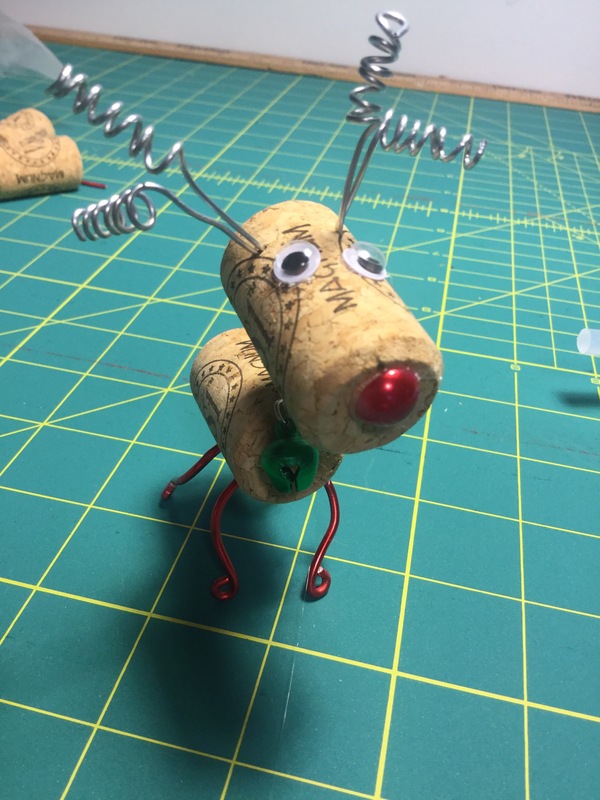 I used a hot glue gun to add the googly eyes and rhinestone nose. You could also use a red Pom Pom, I just prefer the look of the gemstone. The final step is to add a hanger or loop so he can hang on the tree. 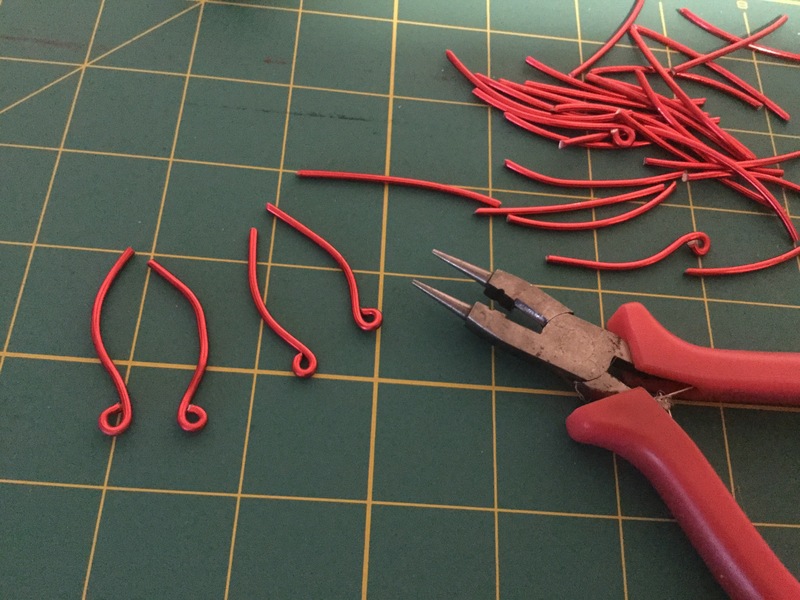 I just used some embroidery floss and a pin, and pushed the pin into the back of his head. 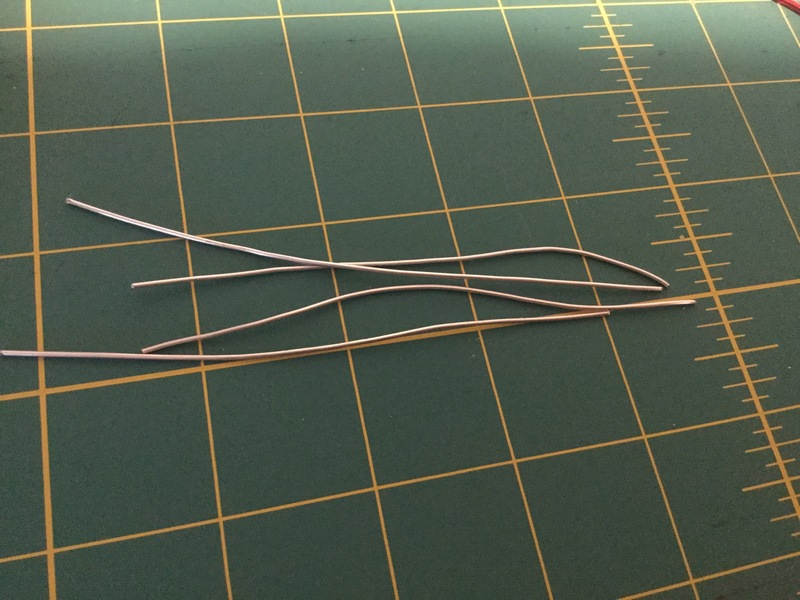 Be careful as the pin tends to bend. 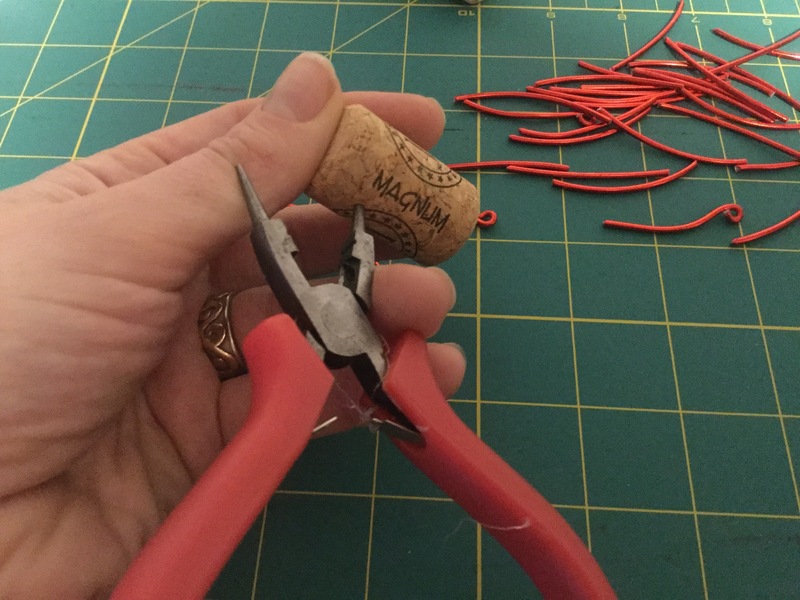 I used the pliers to help push it in. Here is what Rudolph looked like on our tree!